When it comes to strength work, back development, and toning your upper body, we at Lifestyle Updated strongly believe that nothing can beat pull-up bars. 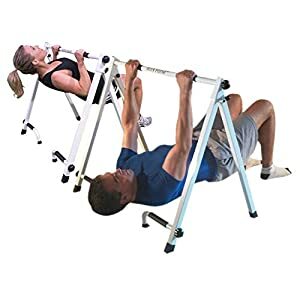 This piece of equipment allows you to leverage the full weight of your body, in order to supply resistance for training the chest, back, shoulders, biceps, triceps, and core at the same time. 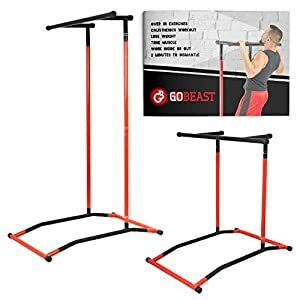 Here you will find portable pull-up bars, wall mounted pull-up bars, doorway pull-up bars and free standing pull-up bars. The list also includes dozens of pull-up bars for sale with discount, so take your time and enjoy the collection. Also, feel free to read our buyer’s guide for best home pull-up bars. Why would you need Pull-up bars? Working out from home, many people eventually hit a plateau. Your own bodyweight can supply up to a certain amount of resistance, and when you hit the ceiling, you can up the ante on cardio but not so much on strength and muscle development. This is where pull-up bars change the game. A single repetition of the pull up activates more muscle fiber than you can ever hope to with a series of push-ups and sit-ups. Even veteran weight lifters run out of breath after the first couple of reaps. The pull-up bar is an excellent piece of equipment because it allows you to work on several muscle groups at once, even with a single move. When you shuffle the moves together though, and incorporate them into a longer sequence, the body starts to sing a tune of sorrow. You will experience fatigue and muscle failure rather fast, which is a welcomed change when working out from within the comfort of your own home. There are so many moves that you can complete on a standard pull-up bar. So much so that your body will look completely different before you become adept at performing these. The progression principle is very important though. Regardless of the pull-up bar type, you will have to start slowly, with a minimal number of sets and reps, and move up the ranks. Again, read our guide on pull up bars, where you will find detailed descriptions for workout programs, and progression principles. Even with the basic pull-up move, you will improve your endurance and strength; tone your chest, laterals, shoulders and arms… then you can add more moves to the routine, and even experiment with extra weight. You’re in for a lot of fun!